What if abuse did not have to turn you into a victim? 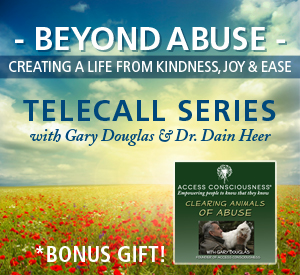 This telecall series will not fit into anything you've previously heard, read or bought as true about abuse. What if abuse did not have to turn you into a victim? What if that is one of the big lies that we all have as some kind of collective unconscious point of view? Whatever form of abuse it is you experienced, your life will stop when you make the energy of abuse greater than the energy of you. What if you are way way greater than the abuse you have experienced, in whatever form that has taken? Is now the time to know it? Is now the time to change it? And to begin creating your life from the kindness and caring you should have been given? What lies am I buying about this that are sticking me? What do I know about what occurred that I’ve been pretending not to know or denying that I know? What other ways can I look at this situation to create freedom for me? Are you ready to try something different in dealing with the issues of abuse? Are you willing to step into the greatness you truly be and start living the phenomenal life you're actually meant to have? Is now the time?